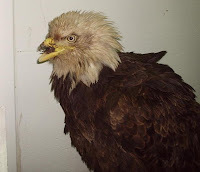 An update from Jannie Fink Cantwell on Beauty, our Bald Eagle who had her beak shot off a few years back. That's her origonal picture back in 2005 on the left. Back then his first name was Beakman and then we found out he was a she. Greetings from North Idaho where summer is in full swing! Your friend "Beauty" is doing great, awaiting what will be just a few weeks until the fitting of her first prototype beak of polycarbonate and titanium screws. Her team of caretakers continues her daily care with delight, anticipating a positive outcome that her new beak will stay in place-long-term. We are only awaiting a date for her procedure, until we can coordinate the mechanical engineer, the dentist, the biologist and the veterinarian, who is on vacation until next week. I promise that you shall be among the very first to know the results! Her temperament has remained consistent. She is slow to trust and loves daily fresh water baths. She is hand-fed salmon daily and vocalizes to us frequently. She remains on a tethered training perch, in the pine forest, overlooking the lake. She has adjusted very well to her new surroundings. Thanks you for your cheery inquiry! Thanks for the update Jannie. We all have our feathers crossed for Beauty.